Weekend links are super late this week, I know, but it’s been a busy weekend. Friday, I got a new computer (Surface Pro 3! ), so I’ve spent quite a lot of time getting things moved around and set up the way I like them (and I’m still not done). Then I spent today taking my kid to a birthday party halfway across town and going to see The Martian. And basically every minute I can spare, I’ve been devouring The Traitor Baru Cormorant, which is an incredible book that I both don’t want to put down and don’t want to be finished with yet because it’s so good. There’s plenty of exciting stuff that’s happened in the last week, though. 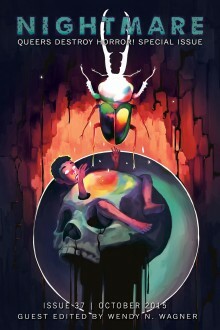 Probably the thing that I’ve been most excited about is the release of Nightmare Magazine’s Queers Destroy Horror Special Issue. If you don’t know about the Destroy SF project, you ought to go check it out now. io9 has a list of all the books you should be lusting after this month. If you just want to see all the covers (with links! ), you can head over to My Bookish Ways. The Golden Compass turned 20 this week, which was news to me. I read it around fifteen years ago and thought it was pretty new then, but apparently I just totally missed it when I was of an age for it. Flowing water has been discovered on Mars–right as a movie hits theaters that partly depends upon Mars’ lack of running water for its plot. Whoops! Lady Business breaks down a ton of data on gender discrimination in SFF awards. The good news is that things are getting better. The bad news is that it’s happening in fits and starts. Also, things were really, really bad to start with. Gizmodo asks why libraries don’t have Dungeons & Dragons gamebooks. It’s more interesting than it sounds. At terribleminds, Stina Leicht has some real talk about “message fiction.” Spoiler alert–ALL fiction has a message. Clarkesworld interviews Catherynne M. Valente. Nerds of a Feather, Flock Together has 6 Books with Kameron Hurley. 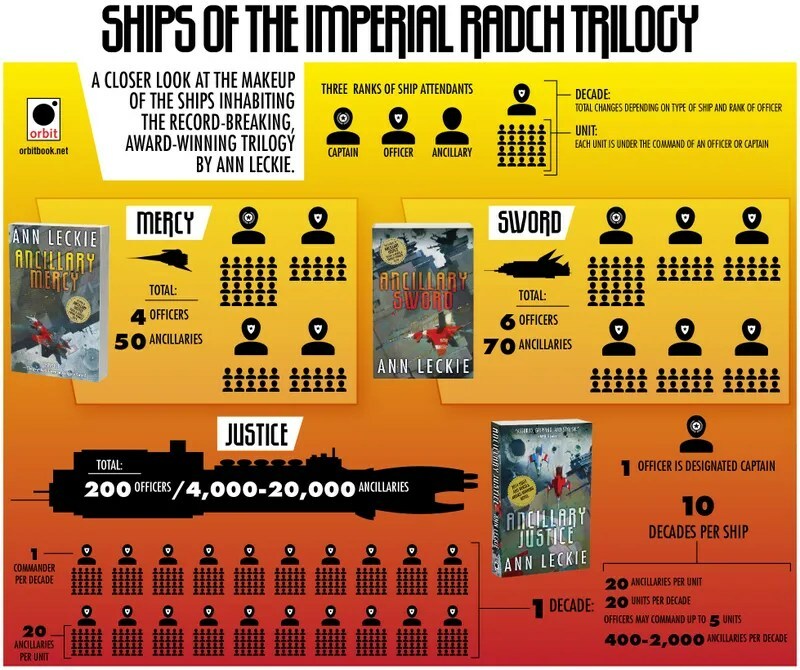 Just in time for this week’s release of Ancillary Mercy, there’s an infographic to explain the ships in the world of Ann Leckie’s Imperial Radch. See it full size at io9.